When I was visiting our dear piano teacher and neighbor, Jane, the other day, I found out that she can cook too! This gorgeous recipe is so tasty and in a way quite impressive yet easy to prepare, just the way we like it. Give it a go and tell me if you share my enthusiasm. Preheat your oven to 200C/400F. Peel and dice the butternut into 1 inch cubes. If you have difficulties with peeling and dicing the butternut squash than please, take a look at http://simplyrecipes.com/recipes/how_to_peel_and_cut_a_butternut_squash/ and you will never struggle again ;-)! 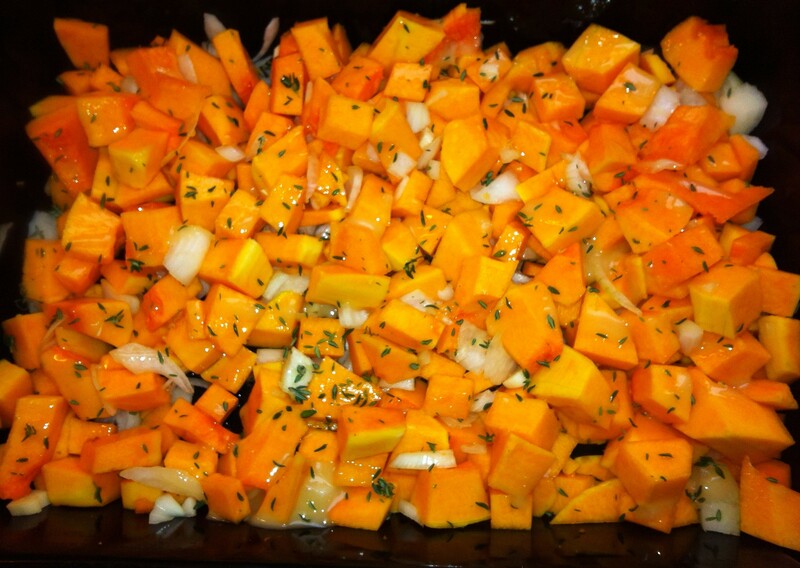 Peel and chop the onion and cloves of garlic and place into a large roasting tray together with the squash. Drizzle the olive oil and honey on top and finish off with sprinkling the thyme. Roast for about 25 minutes or until tender and slightly brown. Once done, take out your roasting tray and pour in your stock. Leave for a minute and carefully transfer all the ingredients and stock to your stockpot leaving nothing behind. Now, add the crème fraîche and the grated, zest and juice of the limes. Then purée the ingredients with a hand blender in the stockpot or puree in batches in your blender. Taste your soup and season with salt and pepper. Before serving bake the flaked almonds in a dry frying pan until they are golden brown. Serve with a spoonful of crème fraîche and some flaked almonds.